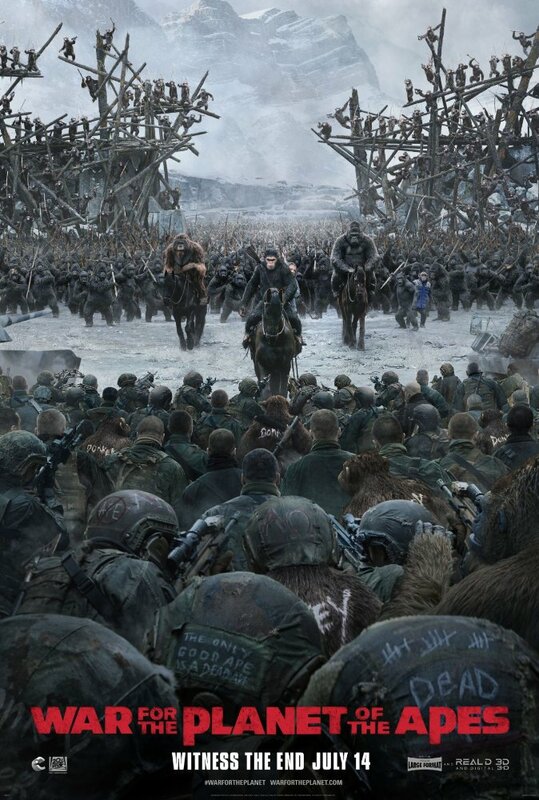 Another weekend and another blockbuster, though it seems this week the returns weren't as large as some were hoping with the third (and presumably final) film in this new Planet of the Apes trilogy as 20th Century Fox's War for the Planet of the Apes delivered an estimated $56.5 million this weekend from 4,022 theaters. That's a little over a million more than Rise opened with back in 2011, but well below the $72.6 million Dawn delivered in its 2014 opening. Somewhat surprising is the fact War carries a budget of $20 million less than Dawn which is almost unheard of for a franchise in this day and time, but with what is still a $150 million price tag this latest film still cost over $50 million more than Rise's $93 million production budget. While I was personally surprised to hear that War wound up opening lower than Dawn it seemed Fox had a better gauge on things as they had their estimates sitting at around $50 million for the weekend. This is a strange trend given the reviews for this thing were stellar and the hype seemed to more than be on its side as support would seemingly grow for a trilogy the further along it went and the more successful it got with each installment-both critically and commercially-as this latest Ape's trilogy has. With this kind of debut though it would seems likely War will just barely recoup that production budget domestically with worldwide cumes making up marketing costs and profit. Speaking to international numbers, War brought in an estimated $46 million from 61 markets with the UK leading the way with an estimated $9.5 million. The other big story of the weekend was that of Spider-Man: Homecoming dropping 61% in its second weekend with an estimated $45.2 million as its domestic cume sits at over $208 million for its first ten days of release. Spider-Man also delivered another $72.3 million internationally, bringing its overseas total to $261 million for a worldwide tally just short of $470 million. All of that said, it will be interesting to see how things play out this weekend at the Box Office as three new major releases debut in theaters including Christopher Nolan's Dunkirk, Luc Besson's Valerian and the City of a Thousand Planets, and Malcolm D. Lee's Girls Trip. As always, be sure to follow the official Initial Reaction YouTube channel as well as on Facebook, Instagram, and Twitter where you can find a new review (or reviews) each week! Read my full War for the Planet of the Apes review here.